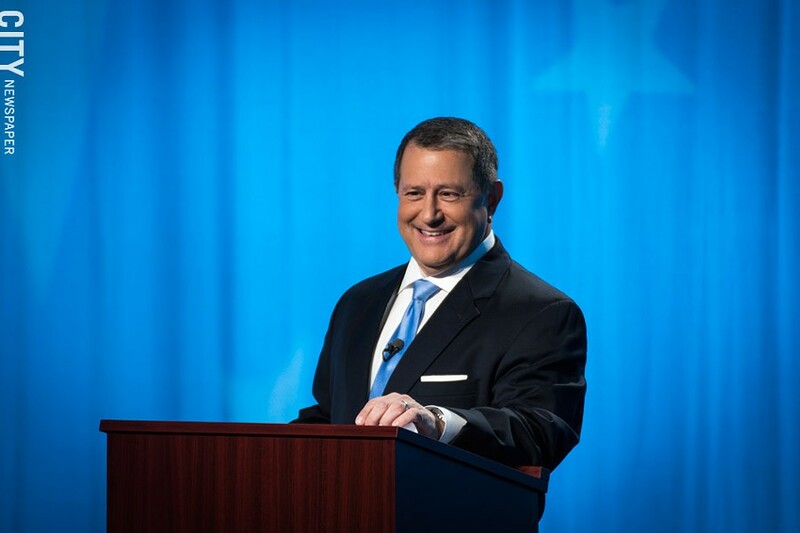 PHOTO BY RYAN WILLIAMSON Democrat Joe Morelle will succeed the late Louise Slaughter in New York’s 25th District seat in the House of Representatives. The 2018 midterms were volatile and contentious, and some sort of change was perhaps inevitable. Professional prognosticators said a Blue Wave would put Democrats in control of the House of Representatives, which it did. And Democrats in New York made good on predictions that they'd flip control of the state Senate. The power shifts in Washington and Albany are going to mean something locally, one way or another. House Democrats have vowed to serve as a check on President Donald Trump and the Congressional GOP, which could affect policies and laws around immigration, health care, trade, and a smattering of other crucial issues. New York Democrats have promised that control of the state Senate – really, of the entire legislative and executive branches in state government – will mean action on measures regarding climate change, voting reforms, health care, education, abortion laws, and gun laws. The Democratic majority is likely to give swift approval to the Gender Expression Non-discrimination Act – legislation that would ensure that anti-discrimination laws apply to transgender people. Cannabis legalization is also more likely to happen with a Democratic-led Senate. Monroe County voters played a small role in shifting the balance of power in Washington, since they elected long-time state Assembly member Joe Morelle, a Democrat, to the 25th District House. The seat had been held for 16 terms by Louise Slaughter, whose death earlier this year left it wide open. Morelle will be a freshman in the House, but he'll likely have greater clout than the average newcomer. He'd served as the state Assembly's second-in-charge since 2013, and during an interview this past spring, he said that experience has helped him develop skills House leaders want to put to use. He also emphasized that he came up through the Assembly with several more senior members of the state's current House delegation. In contrast to the House, Democrats took control of the State Senate without Monroe County's help. Voters re-elected the incumbent Republicans to all six of the seats that cover at least some part of the county, though the Democratic candidates came quite close to flipping two key seats. Republican Joe Robach was re-elected to the 56th District seat, with 54 percent of the vote. Democrat Jeremy Cooney pulled in 46 percent. Rich Funke, the Republican representing the 55th District, narrowly won over his Democratic challenger, Jen Lunsford. Funke received 50 percent of the vote while Lunsford received 47 percent; Lunsford carried the Monroe County portion of the district, but the Ontario County towns pushed Funke over. Robach and Funke won't have the influence they did previously, since they'll now be part of the minority in the state Senate, but both, predictably, say they'll work hard to make sure Monroe County's concerns and needs are heard in Albany. The senators also have a history of working with their Democratic peers in the state Assembly majority. Monroe County voters are sending three Democrats to the Assembly: Jamie Romeo was elected to take over Morelle's seat, while Harry Bronson and David Gantt were reelected to their seats. The day after the election, advocacy groups were already putting public pressure on New York Senate Democrats to address specific topics. Environmental groups released statements urging swift action on climate measures; the Alliance for Quality Education urged action on "school discipline reforms, culturally responsive education, and at last making equitable school funding a reality"; and the pro-business group Unshackle Upstate called on state leaders to "find pro-growth solutions that will strengthen communities across the state." The Senate Democrats aren't likely to get much leeway from advocacy groups, other state and local elected officials, and the people of New York in general. The reason the last time the Democrats controlled the state Senate, it was an unqualified disaster. During this year's campaigns, Republicans pointed back to a 2009 Democratic tax plan they said would have cost Upstate homeowners. But power struggles and infighting around issues such as marriage equality legislation proved a bigger issue for the Democrats, who held a slim majority in the Senate. The GOP preyed on that dysfunction, with some help from wealthy businessman Tom Golisano and political operative Steve Pigeon. Republican conference leader Dean Skelos and GOP Senators George Maziarz and Tom Libous convinced Democratic Senators Pedro Espada and Hiram Monserrate to join with them in a leadership coup, which happened via a surprise leadership vote late in the 2009 session. The leadership crisis, as it's politely called, lasted a month. It threw the Senate and state government into a chaotic stalemate, which is likely what most New Yorkers remember of the last time Democrats controlled the chamber. Democratic leaders are promising better results this time. The party's majority is larger this time – roughly 40 members strong instead of 32 (the Senate had 62 seats before the 2011 redistricting). Individual lawmakers will have less ability to defect and grind Senate business to a halt. Governor Andrew Cuomo, a Democrat who was just re-elected to his third term, will also have an influence on the Senate. He's a notoriously tough, tactical executive who likes to keep tight reins on the Legislature; his affinity for influence and control earns him scorn, but those qualities will come in handy if the Senate Democratic conference begins to fray. Throughout the 2018 campaign, Republicans argued that Democratic control of the Senate could hurt Upstate. Only three members of the Senate's new Democratic majority – maybe four, depending on the outcome of a close Syracuse-area race – will be from Upstate. But Cuomo prides himself on the attention he pays to the area north and west of Albany, and he'll likely impress that priority on the chamber's leadership. And lastly, basic self-interest should encourage Senate Dems to play nice with Buffalo, Rochester, Syracuse, and all points in between. If they want to keep or expand their majority in the 2020 elections, they'll want to make inroads into Upstate's regions, not forsake them. The Assembly and Senate will redraw their district lines – as well as the state's Congressional districts – during the 2021 session. Unless state lawmakers overhaul the redistricting process, the majority in each chamber will have a strong influence in where district lines are drawn. Rochester is a heavily Democratic city, and Assembly Democrats have used parts of the city to anchor larger city-suburban districts. And Republicans have carved up the city and combined those slices with suburban and rural towns where GOP registration is higher. The Funke-Lunsford race is a perfect example of how that plays out. But if Democrats hang on to both legislative chambers in 2020, they'll be in charge of drawing the district lines that will be in place for the following 10 years. And that could mean districts that are more favorable to their candidates.